This is the time of year that deer bucks fight over the ladies (Doe’s) . They are hard to find this time of year. I have made a few attempts to catch the Bucks when they are butting heads with other bucks over the ladies. Until today I have never photographed a buck keeping a herd of doe’s to himself. It’s real close to watching the bigger Elk during the rut. The only other buck near by was a very young buck. Probably a year or two old. The big buck kept the younger buck from getting TOO close to the ladies. 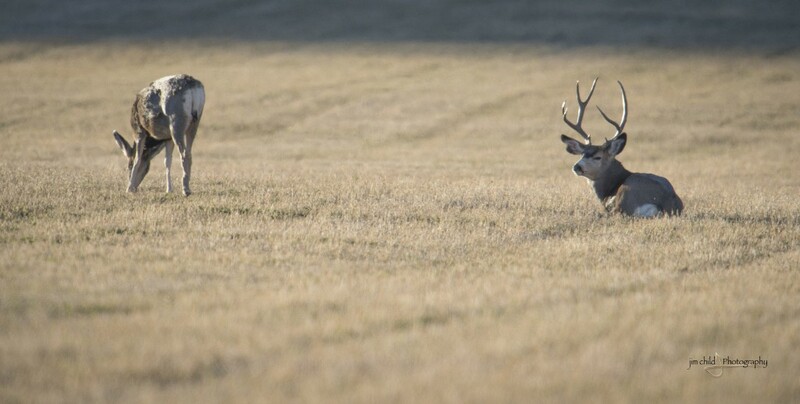 For the short time I was photographing the buck stayed fairly close to one particular doe. Even with 30 or so doe’s close by. The sun was just about to drop below the ridge when the buck realized he needed a rest. Happily surrounded by doe’s and only one teenage buck.